Have you seen Siam weed? 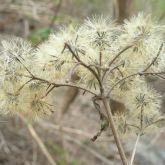 Be on the lookout for Siam weed and report it to Biosecurity Queensland. Early detection and reporting are the key elements in controlling Siam weed. Call us on 13 25 23. 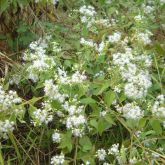 Native to Central and South America, Siam weed is a dense, tangling bush, considered one of the world's most invasive weeds. It quickly invades and smothers native vegetation. In Australia, Siam weed has been the target of a national eradication program since 1994. However, an assessment of the program by a nationally appointed scientific advisory panel concluded that it was no longer technically feasible to eradicate Siam weed. 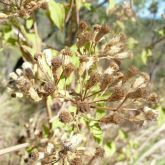 Biosecurity Queensland is working with industry groups, local government and other state agencies to support land managers to develop more realistic and practical goals to manage Siam weed in Queensland. 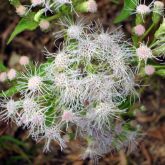 Siam weed is a restricted invasive plant under the Biosecurity Act 2014. 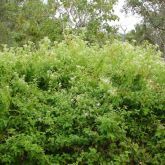 Dense, tangling bush up to 2-3m tall. Scrambles up trees to 20m. Root system is fibrous, shallow in most soils. Develops an enlargement at junction of stem and root, called a basal ball. Leaves are soft, green, hairy, roughly triangular in shape, with distinctive 'pitchfork' 3-vein pattern. New leaf growth can have purple colouration. Leaves emit a distinctive odour when crushed. Stems are smooth, round, fairly brittle, base becomes woody when old. Flowers are pale lilac, appearing white from a distance. Suited to highly productive land types. Generally found in areas with rainfall over 600mm per annum. Found in council areas of Townsville City, Charters Towers, Cassowary Coast, Cairns and Tablelands. Produces large numbers of windborne seeds (more than 80,000 seeds per plant per season). Grows 20mm per day or 5m per year. Dies back in dry season but reshoots after rain. Grows back quickly after fire, slashing or chemical pruning. Most seeds germinate after rain, although some appear to remain dormant for several years. Quickly invades and smothers native vegetation. Increases frequency and intensity of bushfires. Causes skin problems and asthma in allergy-prone people. Remove basal/root ball for smaller infestations. Ensure vegetative pieces are not left in contact with ground where they can reshoot. See the Siam weed fact sheet (PDF, 3.4MB) for further information on control, including registered chemicals and application rates. Applying herbicide at the correct rates, and before flowering, will provide effective control if carried out regularly. Incorrect application can lead to chemical pruning, which will allow plant to re-shoot. Always read label before using any herbicide. 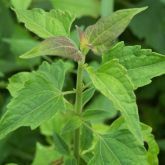 See the Siam weed fact sheet (PDF, 3.4MB) for herbicide control and application rates. Research is currently being undertaken to investigate options for biological control. Siam weed fact sheet (PDF, 3.4MB). How to identify Siam weed video (YouTube).